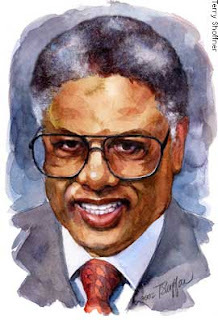 Western Rifle Shooters Association: Sowell: Is America Now On Slippery Slope To Tyranny? Sowell: Is America Now On Slippery Slope To Tyranny? "If there was hope, it must lie in the proles, because only there, in those swarming disregarded masses, eighty-five percent of the population of Oceania, could the force to destroy the Party ever be generated." Keep hoping those who would agree with any of us wake up, but I doubt it until it is too late to stop a new dark age. Sorry if I sound like a downer, but they are so apathetic as not to move. We would have to disrupt their lives in minor ways to get their anger to surface. It is a silly question, most Americans that have the power on independent thought would say yes. It did not start with the Obama phenomena either .... this B S has been going on for 70 years or so. The only difference is that we now have a POTUS that is not held by that pesky Constitution any longer. The reason for that is ... politicians have been ignoring the Constitution more and more in recent history as to make it the "fashionable" thing to do. More than likely we will lose the Supreme Court soon because we have fools who want the Constitution eliminated. It is the last thing that stands in their way to the "workers paradise" and the "killing field". There is no more debate to the question .... we have lost the Constitution. We stand and wait for the "tyrants appetite". If it were not for someone in authority to come to the aid of the people affected by this disaster, then who would? Do you honestly think a money-grubbing, globalist, internationalist corporation like BP would voluntarily open its wallet and compensate those damaged by this spill? Sure, the victims could take them to court. And, after twenty years and numerous delaying tactics by high-priced corporate lawyers, maybe the working slobs would get enough to move them out of the carboard box they were forced to live in after their fishing business went broke. I am no fan of the Imposter-in-Chief. But, he is following Teddy Roosevelt's tactic of using the Presidency as a bully pulpit. If we are truly a government of laws and not of men, then Congress should rise to their Constitutional repsonsibilty and force the issue, not only with BP, but with any entity that encroaches on the persons and properties of U.S. citizens. A 2fer from American Thinker on this topic, first from its Blog titled "Can't control the criminal? Control the law abiding", & next from the main articles titled "The Jews and the Bloody Minded Professors". The last one is especially pertinent. ...Is America on a Slippery Slope...? That can't happen here! This is America! We are the greatest nation on the face of the earth. We are free...and they hate us because we are free. Re: "We would have to disrupt their lives in minor ways to get their anger to surface." And that is a risky proposition given that most of those who'd be disrupted are likely (w/ a 'healthy' assist from the Imperium's press/media sycophants) to blame & then go after those who did such. Would that things were simple, DRAT! Wyn,is right.People just keep ignoring things.If you point things out they say the next election or somebody should do something.Or just look at ya like you're stupid,many see nothing. If you can parse the garbled syntax, White House Chief of Staff Rahm Emanuel claims on ABC's “This Week” that the administration “forced” BP to set up a $20 billion escrow account, "forced" BP to sink an additional well and "forced" BP to increase their oil recovery efforts. TAPPER: Well, let's talk about that. Are you satisfied with what BP has done so far in terms of capping the well? EMANUEL: Well, as you know, there is a test here. OK? BP originally was going to do one relief well. We forced them to do a second relief well. They weren't going to do that. BP originally had a plan on capturing a certain amount of oil. We forced that, as you know, today's reports, they're up to 25,000. By the end of June, we forced them by making them do different things to get up to 50,000 barrels a day. And by mid-July we think we'll be -- and be able to get them to a point capturing 90 percent of that. TAPPER: ... by August, do you think they're going to be working? EMANUEL: And by -- wait a second, and also, Jake, is they originally weren't thinking about $20 billion. And they originally weren't thinking about an escrow account and forcing them to do that. There are certain things that they had to be pushed -- not certain things, like a lot of things that they had to be pushed to do. And pushed to do faster, more of. The NAZIs coined a word to describe this: zwangswirtschaft, literally "compulsion economy." Is Sowell's concern justified? I believe it is. The massive Exxon Valdez liability settlement puts the lie to your assertion.